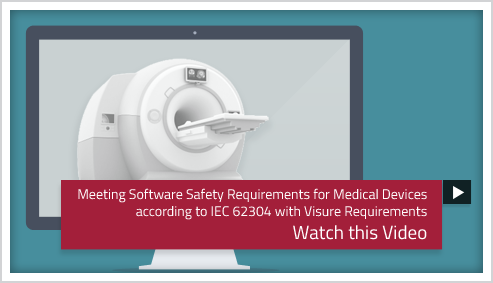 The IEC 62304 standard provides a framework for software development lifecycle processes with activities and tasks necessary for the safe design and maintenance of medical device software. Conformance with this standard fulfills the requirements of 21CFR820 and the Medical Device Directive 93/42/EEC. Visure Requirements offers complete and agile artifact management for the development and verification of medical device software. It provides end-to-end traceability between risks, requirements, verification items, problem reports and project artifacts in one single environment and through the integration with other tools of the lifecycle. This helps organizations in enforcing their process to comply with IEC62304 and creating the necessary deliverables to meet the software safety classes.